Imagine, if you will, a small town with a surprisingly active pottery club. 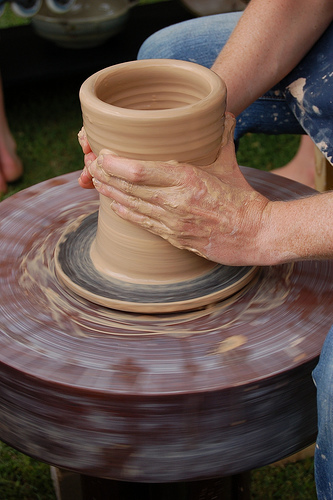 Every week they gather in the local arts centre, and spend long evenings making pottery together. They take lumps of clay and sculpt them into vases, mugs, bowls, teapots and all kinds of things. They share tips and tricks, and help each other out – some people just do their own thing, but there’s a real sense of community. It’s not surprising to find them taking a break together in the local pub, where they spend a lot of time talking about their hobby. The pottery they produce is really high-quality stuff too – a labour purely of love and fascination, not driven by cost/benefit ratios, deadlines or schedules. Now these people are so interested in their pottery hobby that they happily make far more of it than they need, and so they give away much of the end results – after all, it’s a hobby and they have already got all the teapots they need (and maybe they have a bottomless pit of clay nearby or something that makes this analogy more plausible). And other people appreciate all the free pottery, and wonder what they can do to help. These outsiders come with fairly pure intent – they want everyone in the whole world to benefit from these high quality teapots and vases. And so the outsiders think about how they can improve this pottery club. They come up with the idea of helping by shipping in partly-made vases and teapots, and letting the club just “finish them off”. After all, it’ll save time and be easier for everyone involved, and gets everyone towards having those next 10,000 vases that much quicker than just waiting for the club to do so in their own time and expand at their own rate. So truckloads of distorted, broken, low-quality, half-finished wet pottery starts arriving at the back door to the club. Some people start taking this pottery and trying to fix it, and a few people in the club think that it’s a great idea. But a lot of people start getting disillusioned. They realise that fixing other people’s mess just isn’t as fun as starting from scratch and making a proper job of it themselves. The banter in the club stops, and it turns into a factory line – no sooner are they finished fixing up one batch of bodged-up pottery than another arrives. More outsiders are scouting around for sources of low quality pottery – after all, if you give it to this Club then they will fix it. But the output quality starts falling as “good enough” pottery is given away, where before they would have bandied together to keep their high standards. People start enjoying the whole thing less, they start drifting away, and the club slowly falls apart. Takings also fall at the pub. Enough of the story telling. This article is in the “OpenStreetMap” category because I want people to think of this parable when they are considering bulk imports. The strength of OSM is the community. The creation of this dedicated community is a high-quality map. There are ways to help the community, and there is usefulness in using other data sources to assist. But if we continue down the path of treating the community as a mechanism to “fix-up” broken or low-quality data imports, whether that be TIGER, GNIS, NaPTAN or any of the others, then we’ll ruin ourselves in doing so. This entry was posted in Uncategorized and tagged OpenStreetMap on November 10, 2009 by Andy. Except … it *is* fun to fix up other people’s dodgy pottery! Besides which, some TIGER data is very high quality. Other data is utter crap, and there are hours of happy clicking pleasure to fix it up. …not to forget the AND data in India which is *really* crap! Interesting (and very valid) proposition. Is adding high-res images any better? At least when someone donated high-res images, we have high grade clay to start creating excellent teapots. High res imagery is definitely a good thing – it’s like upgrading the pottery wheel or something. Aerial imagery is a tool to assist mappers, not a displacement from collecting map data. Of course, the only caution there is using imagery in isolation – the aim is not to get random people digitizing random parts of the world, but as a tool to assist people who would otherwise be mapping (or failing to map!) that particular area. Excuse me? Who are you calling an outsider? If I want to import data for my area, and my neighbors like it, what makes that your concern? OSM is bigger than your little club. “No, sorry, you and your 300 million neighbors aren’t allowed any vases until you make them yourselves. Yes, there are 10000 unfinished ones outside your back door. But you can’t have them because my branch of the club made our own from scratch and didn’t do it that way, so you can’t do it either.” Hmm, who’s the outsider here? It seems to come down to a question of what the goal is. A small group of dedicated craftspeople who enjoy each other’s company is a pleasant thing, and I can’t blame anyone for wanting to be a part of such a quaint, lovable club. Such a small group might create a gem of a detailed village map every now and then and be very proud of how every street is perfect and every cafe has the current URL and every bench and speed bump is represented. If the social aspect of the group is the most important thing, then there is certainly no need to change anything. Increasing productivity or adding members to the group would not be important. For me, the beauty of OSM is that there is plenty of room for any level of craftsman detail of an area someone cares a lot about *and* there is room for bulk imports to fill in the large lonely areas in between. I would argue that the bulk imports are (at least in areas I have edited) a much better starting point than a blank map and serve a vital connecting role between areas where mappers are active. If I arrived at the project and saw that there were no roads in my city, I would have thought “oh, this project is just a hobby of a few folks in England and Germany” and I never would have started creating my own city from scratch. Thankfully, when I arrived there was already a pretty good road coverage for my area which closely matches the Yahoo imagery and already has correct names for thousands of roads. I am very happy adding details like “this road is actually one way” and “this is a bridge, not an intersection” and here is a restaurant and there is a gas station (I don’t remember the name, I or someone else can fill that in later,) and that church just has a point from GNIS but I can sketch the building to add some detail and find the URL. The imports may not have been what everyone in the smaller original craft group wished for, but I believe they have brought in a much larger new group of people who care about the map in more different ways than before. You don’t *have to be* a craftsperson with a dream to join any more. New arrivals can appreciate the map as much closer to actually being useful now that it is so much more complete rather than as the utopian dream it once was. There is nobody stopping the craftspeople from making their own separate map with only craftsperson contributions, all the software is free and indeed there are several examples of college campuses with their own separate OSM-technology map. On the other hand, there is nothing stopping the craftspeople from contributing to the main map, making the areas they love as perfect and beautiful as they like, meeting together as they have in the past, expanding the boundaries of their beautiful part of the map if they want to. The only difference now is that the frontier is not completely empty because it has been sketched by other hands before. As with any area in OSM, if you can do better than the existing work already done in an area, you are encouraged to improve the map. Now I am going to go and add the businesses I took pictures of earlier today when I was out shopping. Alan Miller – you’ve taken things the wrong way, I’m not calling you an outsider even if you think that I have done. And I have no club, little or otherwise, so please don’t jump in with both feet throwing around insults. Mark Gray – you referred to the “craftspeople” as a “small club”, but if you look at it in terms of OSM then there are around 5,500 people in the craftsman way of doing things all around the world, and approximately 200 people fixing up the bulk imports. So make sure you understand the scales involved and don’t get them the wrong way round. That is making some very distinct assumptions about bulk import as well. A bulk import from a city may very well have ten of thousands of hours of COGO and direct survey behind it (especially administrative boundaries). A mapper on the ground is never going to come close to replicating that kind of information, especially for administrative boundaries which have no strong visual line to follow. Centerline digitization may have come off of NGA funded 3″ ASPRS I aerials which are not public domain; or been surveyed by road crews with differential GPS as the road was built. For our county, we have over 30 full time employees editing streets and administrative boundaries every day, and we are not exactly a rapidly developing county. Our bulk import is way beyond the quality of TIGER 2009 even if it is still a bulk import and reflects some 300,000+ man hours of editing work and ground truth. (Meanwhile, TIGER 2010 will contain our full precision street centerlines and address points – so don’t assume that all TIGER is created equal either). Not all bulk imports are created equal.